US Chemical Storage offers a range of compliant flammable storage units that are completely designed to store flammable, combustibles and corrosives. Our compliant flammable storage units are constructed from heavy-duty, 12-gauge steel for complete protection against hazardous chemicals. Offering ultimate safety for the storing of flammable chemicals, you can be sure that our compliant flammable storage units are designed to store everything from large quantities of hazmat to small quantities of hazardous materials. Fire-rated chemical storage buildings have a heavy-duty steel framing system that provides a safe and protected external environment in the event of a hazardous situation, fire or explosion. Chemical explosions are not uncommon and if a chemical explosion occurs, our fire-rated flammable storage units can provide a safe storage environment. Manufacturing chemical storage buildings for over 30 years, we have the experience and expertise needed to feel safe. 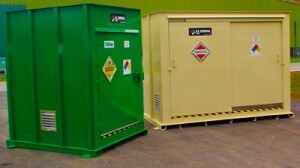 You can rely on our compliant flammable storage buildings for ultimate protection and reliable accessories. Our custom accessories can provide your chemical storage with the compliance needed. Our compliant flammable storage buildings are rated for storing Class 1A Flammable Chemical Storage and/or mixing of Class 1B Flammable Chemicals. Our fire-rated buildings exceed EPA 40-CFR requirements and meet all EPA, OSHA and NFPA regulations. Our buildings are also UL and Warnock Hersey Approved. Accessories for compliant flammable storage units can be customized and are usually mandatory to maintain full compliance. Our wide variety of customizable accessories for flammable storage includes: mechanical ventilation, cooling systems, spill detection, racks, fire suppression, exhaust systems and personal safety equipment. Making use of the customizable accessories available for flammable storage buildings will offer your building with a safe and compliant storage space that will give your personnel and investments the safety needed.